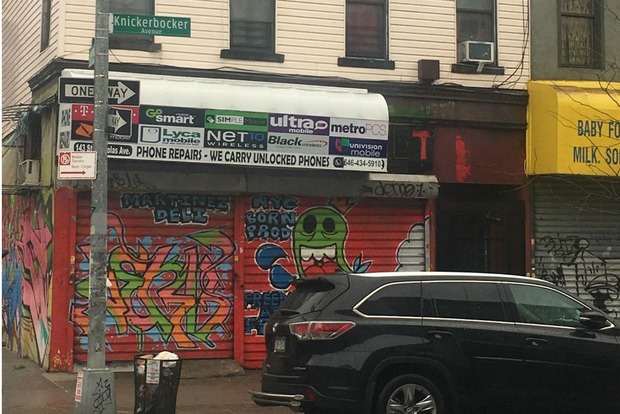 Four men were treated in area hospitals on Sunday night after gunfire erupted inside a storefront on Knickerbocker Avenue, police and witnesses tell Bushwick Daily. Police responded to reports of gun shots at 192 Knickerbocker Ave. at Jefferson Street at 6:19 p.m. on Sunday evening. Inside the storefront four men were wounded by gunfire, according to the officials. The storefront is a former deli, which currently has phone shop signage, and law enforcement officials referred to it as to a social club. A 65-year-old man who was shot in the buttocks and a 26-year-old man who was shot in the leg were transported to Elmhurst hospital from the scene. A 32-year-old man who was shot in the arm was transported to Kings County Hospital—and a fourth victim of the incident, another 26-year-old man whose leg had been grazed by a bullet, later walked into Kings County hospital for treatment. All four men were in stable condition on Monday morning. According to police, the gunfire was the result of a dispute, which broke out at the social club, and it was possibly gang related. This is a developing story; check back later for updates. Featured image: the exterior of 192 Knickerbocker Avenue, where four men were injured by gunfire on Sunday evening. Photo by Magdalena Waz for Bushwick Daily.